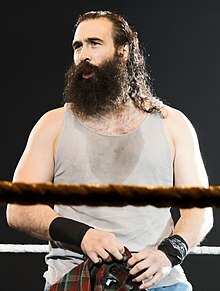 Jon Huber (born December 16, 1979 in Rochester, New York) better known by his ring name Luke Harper, is an American professional wrestler. He is a one-time WWE Intercontinental Champion. When FCW was rebranded into NXT Wrestling, he debuted on the December 12, 2012 episode of NXT as a follower of Bray Wyatt, who introduced Rowan as his "first son". Erick Rowan was later introduced as Wyatt's "second son" and Harper started to team with Rowan. They defeated Percy Watson and Yoshi Tatsu on the January 9, 2013 episode of NXT and defeated them again on the January 23 episode of NXT in the first round of the NXT Tag Team Championship tournament. Harper and Rowan defeated Bo Dallas and Michael McGillicutty in the semi-finals but were defeated in the finals by Adrian Neville and Oliver Grey. Harper and Rowan won a triple threat elimination tag match on the May 2 episode of NXT and defeated Neville and Bo Dallas, filling in for the injured Grey, on the May 8 NXT (taped on May 2) to win the tag titles. On June 20, they lost the NXT Tag Team Championship to Adrian Neville and Corey Graves. Vignettes became appearing on Raw to promote the upcoming debut of the Wyatt Family and they debuted on the July 8 episode of Raw when they attacked Kane. He made his WWE in-ring debut in a tag team match on the July 26 episode of SmackDown, where he and Rowan defeated Tons of Funk (Brodus Clay and Tensai). Harper and Rowan went on a winning streak over many teams for a couple months but suffered their first lost on the October 11 episode of SmackDown from Cody Rhodes and Goldust. On the September 29 episode of Raw, there was a vignette aired where Wyatt set Harper free, saying that he fixed him and gave him a reason to exist. On the November 10 episode of Raw, Harper made his TV return, throwing an unconscious Dolph Ziggler at Triple H and Stephanie McMahon's feet, and expressed his desire to join their team at Survivor Series against John Cena's team. On the November 17 episode of Raw, he joined Team Authority and was immediately given a match for the Intercontinental Championship against Dolph Ziggler. Harper would win the match and his first championship in the WWE. He was ranked #34 of the top 500 singles wrestlers in the PWI 500 in 2014. ↑ "WWE Raw Report: Does Seth Get His Briefcase Back? ; Do You Like Divas Wrestling? ; A New Alliance That Will Shock WWE Fans; A Triple Threat Match; and More". Pro Wrestling Insider. Retrieved 2014-11-24. ↑ "Caldwell's WWE Raw Results 11/10: Complete "virtual-time" coverage of U.K. Raw - Cena vs. Ryback, Survivor Series teams formed, U.S. Title re-match, more". Pro Wrestling Torch. Retrieved 2014-11-24. ↑ "Caldwell's WWE Raw Results 11/17: Complete "virtual-time" coverage of live Raw - final Survivor Series hype, main event Contract Signing, new IC champion, more". Pro Wrestling Torch. Retrieved 2014-11-24. ↑ "Daniel Bryan es el #1 del PWI 500 del 2014 – listado completo". Superluchas (in Spanish). Retrieved 2014-11-24. ↑ Meltzer, Dave (January 27, 2014). "Jan 27 2014 Wrestling Observer Newsletter: 2013 Annual awards issue, best in the world in numerous categories, plus all the news in pro-wrestling and MMA over the past week and more". Wrestling Observer Newsletter (Campbell, California): 34. ISSN 10839593. http://www.f4wonline.com/component/content/article/110-wrestling-observer-newsletter/35067-jan-27-2014-wrestling-observer-newsletter-2013-annual-awards-issue-best-in-the-world-in-numerous-categories-plus-all-the-news-in-pro-wrestling-and-mma-over-the-past-week-and-more. ↑ "Luke Harper's first Intercontinental Championship reign". WWE. Retrieved 2014-11-14. Wikimedia Commons has media related to Brodie Lee.